Mykonos is one of the Cyclades Islands located in the Aegean Sea midway between Greece and Turkey. It's the glitziest of all the Greek Islands, outrageously gay and a partygoers' paradise. As one of the most popular tourist destinations in Greece, you'll find the prices are high and the crowds a nightmare in high season. You can find tranquil spots if you look hard enough but that's not really why you come to Mykonos . If you're heading for this island, pack your wildest glad rags and be prepared for some serious partying. The island of Mykonos has an international airport, four kilometres from Mykonos Town, with connections to Athens and most of the major European capitals. Flying time from London is about four hours. But the majority of tourists arrive by ferry either from Athens (six hours) or one of the neighbouring islands. There are also daily hydrofoil services providing fast connections to Athens and the other islands in the archipelag. If you arrive by ferry be prepared to run the gauntlet of a mob of domatia owners brandishing "rooms to let" signs and photographs of their various establishments. You can be fairly sure of getting some kind of accommodation even you come here in high season without booking in advance but you might find the location and standard of facilities are far from ideal. Finding a taxi can be a nightmare in the summer months, even if you lug your suitcase all the way to taxi square in Mykonos Town (about 10 minutes walk from the ferry port). Your best bet is to call a cab using one of the numbers advertised in and around the port. Mykonos Town (officially called Hora) is an absolute delight but you'll simply have to resign yourself to getting hopeless lost in it. It's a bewildering labyrinthine confection of narrow white alleyways originally designed to confuse the pirates who once plagued the Cyclades . Even with the aid of a street map you'll be hard pushed to find your way around so it's best to just wander aimlessly along with all the other lost tourists. Take the time to explore during the day because the maze of lanes becomes chock-a-block with revellers after dark, especially in high season, and you'll find yourself being swept along with an overwhelming tide of humanity. If you're travelling with small kids, hang onto them for dear life! One of the most charming areas of the town is so-called Little Venice (its real name is Alexandra) where the sea laps at the base of Venetian-style houses adorned with wooden balconies which jut out over the water. This is a great place to sip your sundowner before you take your pick of the myriad of music bars and discos which have given Mykonos its reputation as one of Europe 's hottest party playgrounds. Besides its notorious night time attractions Mykonos also has a wealth of wonderful beaches including Agios Ioannis where Shirley Valentine was filmed, prompting thousands of bored housewives to yearn for a better life on a Greek island. Online Travel guide with the best accommodation in Mykonos (Mikonos). Find the cheapest hotels is Mykonos & get exclusive online deals. Great rooms at bargain prices. Book online now! Compare Hotel Prices and read Reviews from others. Great Hotel rates and information See photos, reviews & what's nearby Mykonos . 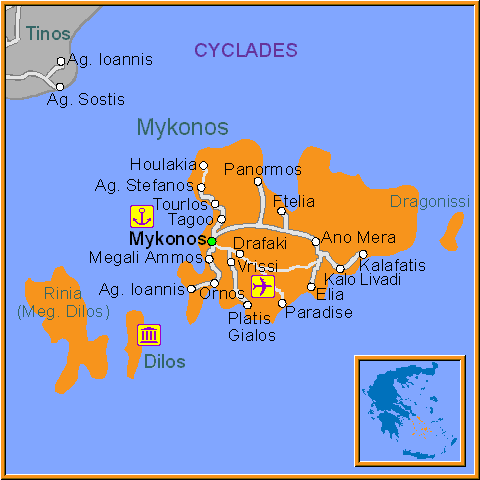 Detailed tourist and travel information about hotels of Mykonos providing also regional information.